Robert Bradbury passed away suddenly and unexpectedly last weekend of a massive hemorrhagic stroke. His passing was the kind of thing that barely registered anywhere except among his immediate group of family and friends—and among a group of dedicated and niche scientists, futurists and technologists. For them, Bradbury's premature passing represented a monumental blow to inspired and imaginative scientific inquiry. While Robert Bradbury, who died at the age of 54, may not have had the most recognizable name in the various scientific communities he was involved in, his impact to future studies, and in particular its relation to the search for extraterrestrial intelligence, cannot be overstated. Bradbury was a giant in this area, a creative and unconventional personality who paved the way for other like-minded thinkers and enthusiasts. To say that the scientific community lost its foremost thinker on SETI studies (the search for extraterrestrial intelligence) and the problem that is the Great Silence (also known as the Fermi Paradox) is hardly an exaggeration. Bradbury was a voracious collector of any and all articles, papers and studies conducted on the subject. From my conversations with him, I can tell you that his ability to recollect and reference these works was uncanny to the point of absurdity. He was an authority in the truest sense. Nobody more than Robert insisted on the simple fact that the correct resolution of Fermi’s Paradox—the fact that we do not observe any presence of Galactic extraterrestrial intelligence—will provide us with crucial insights into humanity's future. It was this particular notion that has personally driven me to pursue SETI studies as a means to predict humanity's potential developmental trajectories. Simply put, if you can predict, or even observe, how advanced extraterrestrials operate, we stand a better chance of understanding our own future. Despite the eeriness that is the Great Silence, Bradbury applied a natural optimism to his work. He sought to construct and develop hypotheses to the Fermi problem that did not jeopardize the potential for human possibilities. This included a grandiose "cosmic vision" of humanity's future, and in this sense he was an heir apparent to Olaf Stapledon, H. G. Wells, and Freeman Dyson. To this end, Bradbury put forth a number of intriguing theories—theories that have since become foundational concepts amongst serious futurists, transhumanists and those concerned about the potential for a technological singularity. 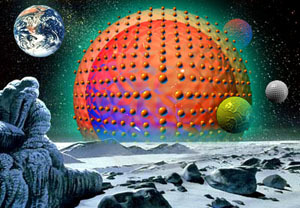 In particular, Bradbury was intrigued by megascale engineering concepts such as Dyson Spheres and Jupiter Brains. He even came up with one of his own, the the so-called Matrioshka Brain—a megascale computer that could exploit nearly the entire energy output of a star. Bradbury could never be accused of thinking small. Such concepts would go on to influence such thinkers as Anders Sandberg, Nick Bostrom, Robin Hanson and Ray Kurzweil. One of his most important works came in 2006 in his collaboration with Milan Ćirković, “Galactic gradients, postbiological evolution and the apparent failure of SETI" (New Astronomy 11, 628-639). In this paper, he argued that the most likely trajectory of a postbiological (i.e. digital) community would involve the quest for computational efficiency and optimization. Such a society, he argued, would likely involve spatially compact civilizations that would be extremely hard to detect, especially if located in outer regions of the Milky Way. This conclusion has served as an elegant and rather optimistic answer that contrasts to the more doom-and-gloom suggestions that are typically put out. The paper also criticized the orthodox approach to SETI projects, which Bradbury found irritatingly old-fashioned and conservative in the extreme. Instead of listening for intentional (or intercepted) radio messages, he thought it would be far more promising to search for artifacts and traces of astroengineering of advanced technological civilizations, like Dyson shells or Matrioshka brains. Such searches, he thought, would have to be conducted in the infrared part of the electromagnetic spectrum. A natural extension of this concept was the project of setting up new directions and expanded range of techniques for SETI observations, something which was consistently hinted at during the half-centennial jubilee of the OZMA Project in 2010. This study was, sadly, the last one Bradbury worked on and will be published posthumously. Clearly, his departure will be a great loss for the astrobiological and SETI communities. At a personal level, Robert Bradbury was known as a generous, driven and often outspoken individual. His unorthodox beliefs, a hallmark of the transhumanist and Extropian communities of which he was a big part, often translated to personal opinions that made others uncomfortable. Bradbury never shied away from saying things that might offend others, but this largely came from his powerful sense of outrage towards certain issues, including the problem of death. A radical life extension crusader, Bradbury railed against the needless deaths of people the world over and and how society spent so relatively few resources to address the issue. Along these lines, Bradbury also made a considerable impact on early efforts to re-conceptualize and pathologize the aging process. Back in 1991 he was already framing the problem of aging as something that could be solved. To that end he devised a theory of aging that involved insights into genetic defects, poor biological programming and insufficient repair mechanisms; the work has served as a precursor to Aubrey de Grey's Strategies for Engineered Negligible Senescence (SENS). Not content to merely wax philosophical on heady issues, Bradbury made a number of attempts at various tech ventures, but often to poor results. He desperately wanted to succeed at being a technology entrepreneur, and at the time of his passing, may have felt deep frustration at not being more successful in this regard. He also wanted to marry and have children, but seemed to have doubts about having a successful and lasting relationship. It may take a few years before Bradbury's contributions properly hit the radar. He leaves behind a rather remarkable body of work that I predict will eventually get the respect it deserves in the various scientific circles he was involved in. Thanks to Milan Ćirković and John Grigg for helping me write this piece. Thank you for writing this very fine obituary. Thanks for taking the time to prepare this and tell us about this great man. I was saddened when investigating my dead link to his Matrioshka Brain essay (in my page http://www.gwern.net/Simulation%20inferences#fn6 ) to learn of his death. Also saddening is that his website is dead already and does not seem to be preserved in the Internet Archive or in WebCite; nor does googling turn up any mirrors. Unfortunately, my tools only make copies of webpages I directly link, so I only have that Matrioshka Brain essay.